Will the Eagles keep Nigel Bradham, Mychal Kendricks, or both? Over the upcoming Philadelphia Eagles offseason, there are going to be many pointless debates centered around Carson Wentz vs. Nick Foles. There really is no debate, to be clear. The Eagles' starting quarterback is Wentz. On the other side of the ball, however, there is an interesting "Sophie's Choice" situation brewing at linebacker, in which Howie Roseman and Co. may have to choose between Nigel Bradham and Mychal Kendricks, the team's two starting linebackers for most of the season in 2017. Mailbag: What could the Eagles reasonably expect in return if they traded Nick Foles? Bradham is set to become a free agent in March. In each of the last two seasons, Bradham led the team in tackles (102 in 2016, 88 in 2017), while also contributing 13 pass breakups, 3 forced fumbles, 2 fumble recoveries, 3 sacks, and an INT during that span. 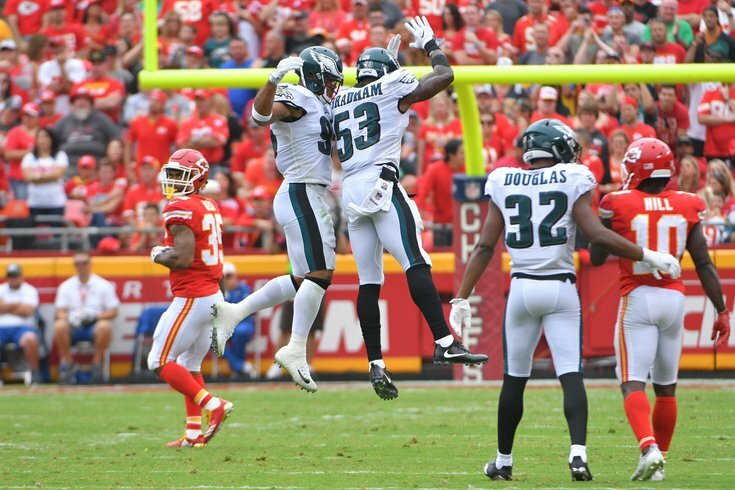 After Jordan Hicks went down with a ruptured Achilles, Bradham assumed responsibility of the radio helmet, taking signals from Jim Schwartz and getting the defense lined up. "I think Jordan brought a lot to our defense, was the quarterback of our defense and was a playmaker," said Schwartz in January. "I think one of the unsung stories of this season has been Nigel picking up that communication. "Nigel has always been a fiery guy. Sometimes I think he runs about five extra miles trying to get to the pile to make sure he's delivering whatever message he's going to deliver and it brings us a lot of energy, it really does. But that's a tough thing to do when you've got the coach speaking in your ear about, ‘Hey, remind this guy this and we're going to this call, but check it to this if something else is going on’. And he's done a really good job handling all that communication, and it's been fairly seamless." Clearly, Bradham was (and is) ahead of Kendricks on the Eagles' metaphorical importance scale, since he was a starter over Kendricks prior to Hicks' injury, and because Schwartz chose Bradham over Kendricks to take on communication responsibilities. That said, Kendricks had a very good 2017 season as well. He was second on the team to Bradham in tackles, with 77, despite playing 311 fewer snaps on defense. Kendricks also chipped in 2 sacks and 6 pass breakups. From 2012 to 2016, Kendricks' participation in the regular defense decreased every year, with the low point coming in 2016, Schwartz's first year running the show. As noted above, Kendricks' snap count rose sharply in 2017 due to Hicks' injury. In Schwartz's scheme, the slot corner is more of a starter than the third linebacker, as a third linebacker has been on the field for the Eagles for less than 30 percent of the snaps during Schwartz's tenure in Philly. In 2018, Kendricks will count for $7,600,000, which is a sizable rock in the salary cap jar of a team that is going to have to trim about $10 million just to get back under the cap. In 2017, free agent linebackers found a very soft market. Consider Zach Brown, who had 149 tackles, 4 sacks, 4 pass breakups, 2 forced fumbles, an INT, and a spot in the Pro Bowl in 2016 with the Bills. During the 2017 offseason, as a free agent, Brown signed a one year deal with the Redskins worth $2.3 million, with playing time and performance incentives. In other words, it may not take a mountain of cash to bring Bradham back, especially with potential discipline coming down from the league for his two arrests in 2016. Hicks will be returning in 2018, though certainly, he has earned the "injury-prone" label. Still, the Eagles are almost forced to rely on his good health moving forward into 2018 because they simply can't afford the luxury of paying two additional linebackers a lot of money, even if they needed that extra guy last season. The salary cap can be unforgiving to winning teams with loaded rosters, and something has to give. If Bradham proves to be too costly to retain in free agency, Kendricks would be a starter, and keeping him at his $7.6 million cap charge would be a reasonable option, even if he is overpaid. If they're able to bring Bradham back on a new deal, then $7.6 million will be a monumental cost for a third linebacker. In that case, expect Kendricks to be back on the trading block once again in 2018 like he was in 2017. Or maybe there's a team out there willing to give up more substantial compensation for Hicks? To be determined, but it will all start with Bradham's new deal or lack thereof.